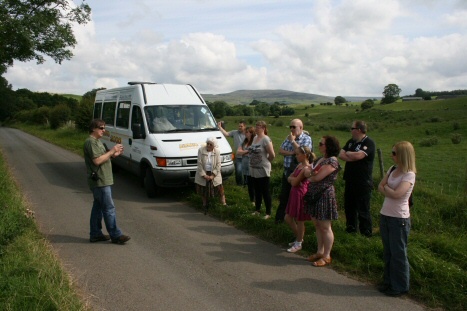 This is the first of the all day summer trips organised by myself, the object was to take people around some of the supernatural sites of the Eden valley. So on a hot sunny Saturday (30th of July) at 10am in the morning we boarded the minibus hired from Airbus 2000, with Martin at the wheel. The first stop being Lanercost bridge, associated with stories of Boggles (The name given to mischievous fairy people) who in earlier times would jump out and frighten the horses of riders crossing the bridge, before telling tales of Boggles we left on the parapet two small cakes as a gift for the Boggles in the hope they would leave us in peace, it must of worked as we were left alone, giving me time to talk about the secret horde of tiny clay smoking pipes discovered by an archaeologist field walking nearby, he quickly covered them back under the ground leaving them for the little people. Moving on we briefly stopped at Naworth Castle to talk about the ghost stories associated with the Castle, we then travelled along the Eden valley where on the way I told stories about Talkin Tarn and Cumrew, stopping on the roadside overlooking Croglin Low Hall, I gave the talk about the legend of the Vampire, who in the 17th century just after the English Civil war attacked a young lady in her bedroom and bit her neck drawing blood, and the subsequent chase by her revengeful brothers, to hear the full story you will just after come on the next tour or wait till the Halloween tour at the end of October. We travelled onto the quiet village of Renwick with a brief talk on the legendary creature who once lived in the church yard, we then moved along through quiet roads to Little Salkeld and the stone circle nearby, Long Meg and her daughters, telling the tale of a coven of witches being turned into stone by the wizard Michael Scott. Telling the tale that if you try to count the stones correctly the witches will come back to life. After looking round the circle which is situated in wonderful countryside overlooking the Eden valley surrounded by hills, with the Pennines in the east and the lake district fells in the west, apart from a couple of students doing a college course on stone circles we were the only people there, so different from Castlerigg circle near Keswick which at this time of year would be packed with tourists. Boarding the bus we moved on through Langwathby village crossed the river Eden and turned into the lovely hamlet of Edenhall with its beautiful sandstone buildings, turning down a narrow lane we stopped at the local church where I told the story of the magic glass goblet stolen from fairies by a servant of the Musgrave family whose Hall was nearby, with the legend of, as the servant stole the cup the fairies called out “should the cup break or fall farewell the luck of edenhall” the servant presented the goblet to his master and told him the curse laid on the cup, since then the Musgrave family have kept it safe and finally gave it to the Victoria and Albert museum in London, where it is now on display in the glassware display. We then travelled on to the market town of Penrith, walking into the church yard of St Andrews we looked at the giants grave and the giants thumb where I told the legends associated with them, of man-eating giants and kings of old Cumbrian kingdoms, we then broke up for a well earned lunch break. After lunch we travelled down the A6 road to Eamont village to see the two stone age henge’s there, the first one called Arthurs round table is a round circle of grass surrounded by a ditch and earthworks, supposedly named after King Arthur who we think once ruled this area, although we know this henge is much older by two thousand years at least, perhaps Arthur used this as a meeting place for the local tribes who lived here? We will never know. Moving along the road, a short distance away is the second henge, Mayburgh henge, an enormous circle of stones built up to a height of over twenty feet, a about seventy yards across, it has been estimated that to build this massive henge it would have took one thousand men six months to build it, using cobbles from the river Eamont nearby, again nobody knows the purpose of this monument, was it a meeting place? a yearly calendar? a religious centre or a sporting stadium? Who knows? Climbing back on the bus we travelled north on the A6 through Penrith stopping just outside Plumpton to talk about the ghost stories associated with this area, with stories of ghostly highwaymen and murderers, finishing with the story of Percy Topliss known as the monicled mutineer, who after a chase from Carlisle was caught and after a shoot out with local Police was shot dead, his body being buried in Penrith’s Beacon hill cemetery in an unmarked grave in 1920, his belongings including his monicle was handed to the museum in Penrith. Moving on we passed the site of the old Roman fort of Voreda, built at the same time as Hadrians wall and was garrisoned by the second cohort of Gauls, auxiliaries from France. Turning off the A6 we stopped at a place rich in stories and legends of King Arthur, known as Tarn Watheling, I told tales of ghosts, knights of the round table, of villains and old hags. We moved on crossing the river Eden at Armathwaite bridge, passing the Fox and Hounds inn at the far side of the bridge, I told the tale of the ghostly figure of a woman supposedly being seen looking out from the doorway looking for her lost children who were killed in a coaching accident. Travelling on we came to Corby Castle in Great Corby, where I told our final story of the Radiant boy who haunts the castle. We then travelled on and back to Brampton where a well earned cream tea awaited us.